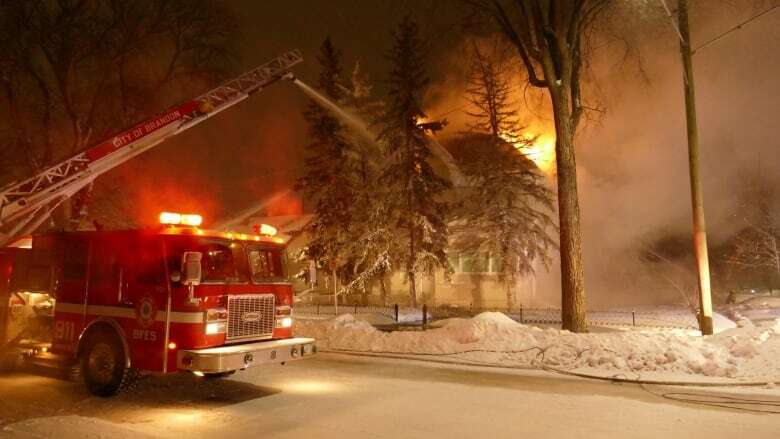 Brandon police say a fire that destroyed a three-storey home Tuesday was deliberately set. The fire broke out around 2:30 p.m. at the home, located on the corner of Fourth Street and Louise Avenue. The blaze sent flames out of the side of the house and thick smoke into the sky, which could be seen from several blocks away. Police arrested a man who lived on the main floor of the house at the scene of the fire. Firefighters remained at the home, which had been converted into six apartments, into the night on Tuesday. Police officers made attempts to make sure everyone got out safely and no injuries were reported, they said. The 34-year-old resident was arrested for arson, police said Wednesday morning.